The Insurance Commission is again partnering with Netball WA to promote the ‘Belt up’ road safety campaign by distributing almost 7,000 Belt up-branded netballs to senior community netball teams across the State. The campaign encourages seat belt use to reduce the severity of injury in a car accident. In 2017 alone, 71 people who were not wearing a seat belt were killed or seriously injured on WA roads. The netballs have been delivered to the State Netball Centre, and will now be distributed to more than 1,200 teams in regional and metropolitan areas, while the Belt up messaging will also feature on a bespoke netball to be used at the NAIDOC Carnival. It’s the sixth year that Netball WA has teamed up with the Insurance Commission to deliver the Belt up message to more than 230,000 netballers throughout WA. Over 30,000 Belt up netballs have been placed in the hands of the community in that time. Insurance Commission Chief Executive Rod Whithear says: “It’s frustrating for us at the Insurance Commission to assess motor injury claims from people badly hurt in car crashes where it’s clear they weren’t wearing a seat belt. That behaviour unfortunately results in more serious injuries, which can have lifetime consequences for them and their families. Netball WA Chief Executive Officer Simon Taylor thanked the Insurance Commission for its long-running support of grassroots netball. 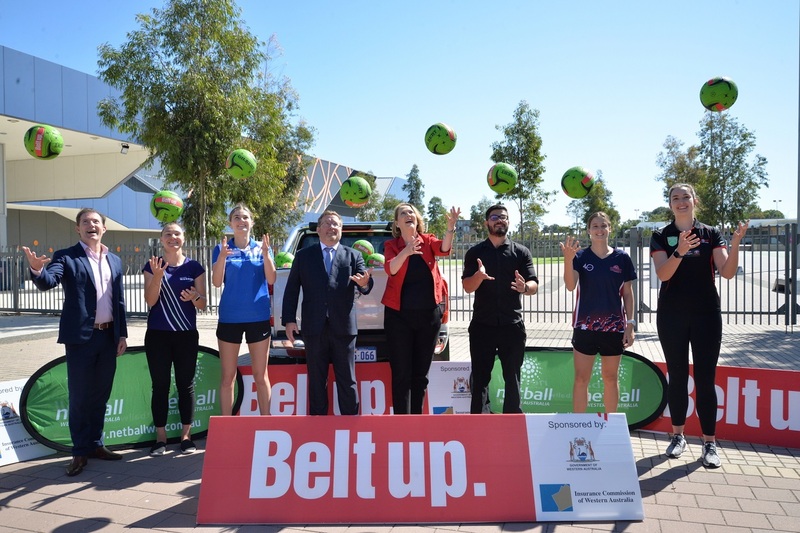 “The Belt up message will again literally be in the hands of thousands of netballers across Western Australia,” Taylor says. “Netball is played in every major town across the State and we want these Belt up balls to be a reminder to all of our participants to stay safe on our roads. The Insurance Commission has supported and funded the Belt up campaign since 1997. The campaign’s other sporting partners are West Australian Country Football League (WACFL), RugbyWA and Football West.